The 500 Series is truly the best of its kind. It is the only box on the market today manufactured with a one piece housing, no welding, all new parts (unlike our competitors! ), uses original pitman arm and has a 14-1 ratio. CPPs 500 Series box has been factory-tested to ensure quality that you have come to expect from us. This direct replacement for the 605 produces excellent road feel and driver feedback eliminating leaky, sloppy steering! 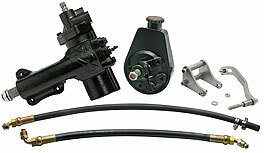 Our Conversion Kit includes the 500 Series box with power steering hose kit and pump and early model small block Chevy V8 power steering pump bracket. Optional chrome finish and new pitman arms are also available. CPPs new CP50003 power steering conversion gearbox for the 1958-64 Chevrolet is the newest member to the 500 Series Power Steering family. All CPP 500 Series power steering boxes are the key components to a high performance modern style power steering system. The CP50003 features a 14:1 ratio unit which provides superior directional control and road feedback, as well as a more stable feel to the driver. CPP engineered the recirculating ball gears for low friction and increased steering response. An open centered, rotary type valve provides smooth operation throughout the steering range while retaining excellent road feel. 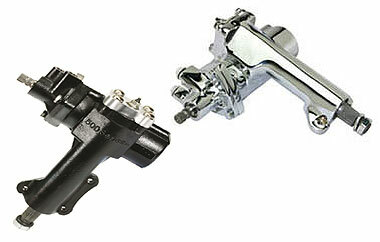 For the 1958-64 full-size Chevrolet, the 500 Series is a direct replacement for the manual steering box and is bolt on easy to install. Another unique feature is the mounting bosses which are integrated into the casting, eliminating the need for an external bracket and lining up perfectly to your column without shims. 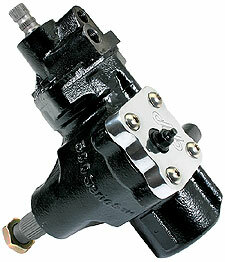 Works with both the original and aftermarket steering columns and sway bars. 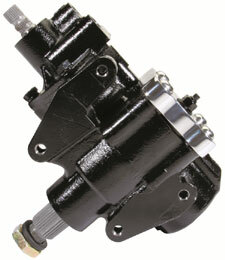 This is the very best gearbox available on the market today to convert your full-size Chevrolet to power steering! Note: It may be necessary to use notched radiator, part number AL010282ANDZ. Our 500 Series Box for your Nova, Camaro, Chevelle or Fullsize car is truly the best of its kind. A direct replacement for the factory power steering box or an easy way to upgrade from manual steering to power steering. The 14 to 1 ratio adds a new dimension of handling to your car, smooth operation and excellent road feedback. 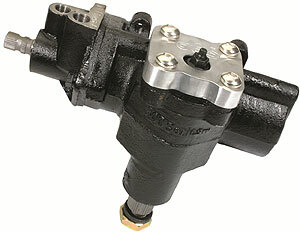 Also, works with factory power steering pitman arm and 3/4-30 rag joint. Uses the popular 7/16 tube size (11/16-18 inverted flare)pressure and 3/8 tube size (5/8-18 inverted flare) return port fittings.